There is no specific asthma test known at this moment, but there are several ways of making an asthma diagnosis. 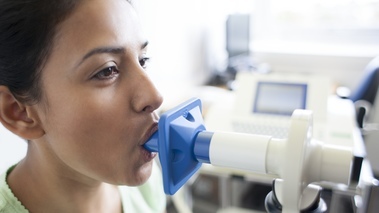 To diagnose asthma in a patient, a doctor discusses the medical history of the patient and performs a physical exam, which is a combination of a variety of tests. The answer to the question ‘how is asthma diagnosed’ is a bit complex. In some cases, patients need lung function test, while in others they need sinus X-ray or a chest x-ray. A doctor must first ask you questions regarding the symptoms you are having. Such questions will not only help him/her to diagnose asthma, but to also find the causes of these symptoms. If you need, you can always write down such symptoms and bring the notes at the doctor’s office as a reminder. You need to be prepared to answer questions regarding family history, lifestyle and medications you may be taking. You will be speaking about physical problems, symptoms and how often and when they occur. This is why notes come in handy. The doctor will ask of medical conditions you are currently having or have had in the past. When asked about asthma symptoms, doctors refer to shortness of breath, coughing, wheezing and tightness in the chest. A history of eczema and certain allergies can also increase the risk of asthma, as well as family history of asthma, allergies or eczema. When speaking to your doctor, you should inform him on any exposure to environmental factors that you have noticed that worsen the symptoms. These usually include pollen, tobacco smoke, dust mites and pet dander. In addition, you should tell the doctor if you are experiencing worsening in symptoms when being sick. The doctor may turn to physical examination if they think you have asthma. They will look at the nose, throat, eyes, ears, skin, lungs and chest. They may include several tests to determine how you breath, what is the condition of your lungs, sinuses or to rule out other conditions. One or more tests for breathing are usually recommended by doctors when it comes to diagnosing asthma. These are known as lung function tests and are used with the purpose of measuring the patient’s breathing. They are done after or before a patient inhales bronchodilator. This is a medicine used to open up the airways. If the function of the lungs of the patient improves with the usage of this medicine, the patient is probably suffering from asthma. In order to be sure, the doctor can also prescribe a short trial where the patient will use asthma medications. The patient will be viewed during the trial in order to see whether the asthma medications help or not. The most common lung function tests are spiromerty, peak airflow and trigger tests. Spiromerty is the most recommended test in diagnosing asthma patients. This test includes breathing into a device-connected mouthpiece called a spirometer. This mouthpiece measures the air amount the patient is breathing in and out, the rate of the breathing and even the flow. When given a spirometer, you will be asked to take a very deep breath and exhale forcefully. Peak airflow is a test that is done with the use of a peak flow meter. This device is rather small and is used by breathing into it. This handheld device will check at which rate you force the air outside your body, more specifically your lungs. In duration of the test, you will be asked to breathe deeply and blow forcefully and fastly in the device. Such tests can also be used at home by asthma patients. Trigger tests are most often used when all other results of the patient are normal and there is yet to determine why the patient is experiencing asthma-like signs and symptoms. Using the most common asthma triggers to provoke a reaction from a patient is one of the testing alternatives. When a patient does not have asthma, they will not react to this test. However, they will show some asthma symptoms if they do. There are also other asthma tests used to determine if the patient is allergic to certain substances and particles. Blood tests are also used to give an idea of the overall health of the patient. There are also specific tests used to measure immunoglobulin E level, usually released during allergic reactions. People who have allergies also have larger quantities of this protein in their body. If the doctor thinks their patient has something other besides this chronic condition, they may even decide to run other tests such as acid reflux test, chest x-ray, sinus x-ray etc. All these tests are used to help the health professional determine whether you really have asthma and whether there are some coexisting conditions with it. Such conditions may also include GERD and even sinusitis. As mentioned, this is not an asthma test, but is commonly used to check if something else is causing the asthma-like symptoms in a patient. The x-ray is a body image created by radiation doses, used to see internally and to diagnose conditions such as bronchitis or even broken bones. A doctor can decide to perform such exam on a patient with the purpose of checking the heart, bones and lungs of their patient and see if the condition causing the symptoms is actually asthma or something else. Heartburn is the symptom of GERD, a gastroesophaegal reflux disease. This disease often worsens the symptoms of asthma and is connected to it. There are certain tests that can check whether a patient has or has not GERD condition. More than 70% of all patients that suffer from asthma experience the heartburn of this condition. Generally speaking, a person diagnosed with asthma is twice at risk of having GERD than those who are do not have the condition. The case is even worse for the treatment-resistant patients of asthma. GERD can irritate the asthma and cause more severe asthma symptoms. Even though the relationship between the two is still not very certain, it is known that this condition can worsen the symptoms of asthma patient and vice versa. Treating one will help relieve the symptoms of the other condition, which also confirms this fact. Doctors will check if you have GERD and this is the asthma cause if the asthma is adult-onset, if you experience the symptoms after eating, exercising, lying down or at night. In addition, patients who do not respond to the treatments for asthma are often checked for GERD. Identifying the allergies that cause asthma symptoms in patients is highly important. Allergies often go in combination with this condition. This is why one type of asthma is allergic asthma. When asthma is triggered by allergies, this is called allergic asthma. This is why a doctor must perform allergy tests and see how a patient reacts to certain substances. Nasal polyps and sinusitis can cause worsening of asthma symptoms and make the entire treatment process more difficult. Sinusitis or sinus infection is a sinus inflammation that comes as result of certain infection. A CT scan should show if a patient has a sinusitis. Treating the sinus infection will improve and prevent the symptoms of asthma. Many researchers have looked for and shown that there is a certain connection between the two. People who have both conditions suffer from more severe symptoms of asthma, have more severe flares and attacks and cannot sleep well. Sinusitis and asthma in combination are more common in women than in men, in whites than in other racial groups and cannot be the same for every asthma patient. Additionally, when the asthma is more severe, the sinusitis is more debilitating. This type indicates that the patient experiences symptoms that occur less than twice every week. The symptoms occur with less asthma attacks or exacerbation. The nighttime symptoms are very infrequent i.e. they wake up less than two nights every month. The symptoms in this case occur more than 2 times a week. However, they occur less than once every day. The attacks affect the patient’s activity and the nighttime symptoms occur more than two times a month. The symptoms occur every day, while the nighttime occur more than once every week. The patients suffer from asthma attacks that can affect the everyday activities. These attacks can also last for a very long period, such as several days. These patients require daily consummation of asthma medication, prescribed to control the symptoms of asthma and prevent the attacks. The patients in this group suffer from asthma symptoms in duration of day and night. There is limited activity for these patients and the asthma attacks are hard and very frequent. Diagnosing children is different from diagnosing adults, especially if the children are above 5 years old. When they are in this age, they cannot be given a breathing test. Instead, the doctors may ask the child about the symptoms and signs that may indicate this condition. They may also prescribe a bronchodilator if they think the child is suffering from asthma. This is a testing to see if the bronchodilator will reduce the symptoms in the child or not. If it does, this is a strong indicator that a child actually has asthma. The majority of children diagnosed with asthma actually develop the first symptoms at this age, but this is the most difficult age for asthma diagnosis. In many cases, telling if asthma is the cause of symptoms or some other condition is a very difficult task. The reason behind this lies in the fact that asthma symptoms often occur with other conditions common with children this age. For example, a young child may wheeze when they have respiratory infection or a simple cold. This may be the first asthma indicator, but it is often not worsened or other symptoms do not show until they are more than 5 years old. A child can wheeze because of the tiny airways in their body. These airways often become narrow when the child is having an infection of respiratory tract or a cold. As the child grows, so does his airways, so if the wheezing continues to occur, the doctor will start suspecting asthma. Children are more at risk of asthma when wheezing if they have a family history of asthma patients, i.e. one or both parents are diagnosed with this condition. Additionally, the child can be diagnosed with this condition if they show signs of allergies or eczema. If a child shows allergic reactions to common allergens such as pollens or a different airborne allergen, they are at risk of asthma. In addition, when a child wheezes without any other symptoms of infections or cold, you may want to check for asthma. The most sure way to diagnose asthma in patients is lung function test, done in combination with results from medical history and physical exam, as we mentioned. However, doing lung function test in such a young child is almost impossible, so the doctor must solely rely on medical history, physical exams and the signs and symptoms of the patient. In addition, a child of this age will not be able to speak of the signs and symptoms as detailed as an adult. In many cases, doctors turn to a trial of medicines to see the response from the child. These trials can last from 4 to 6 weeks.